The Electra King was a line of electric city cars made in Long Beach, CA from 1963-1980 something. There's one in my neighborhood I've always admired, and I finally got the chance to drive it. It's not a "good" car, by any standard, and the score reflects that. But I sure as hell like it. A lot. I have this recurring argument with my wife over this concept: you can like something that you don't think is actually any good. She never quite believes this is a thing, stuck in the archaic belief that you actually have to feel something has real worth to like it. I maintain that you can like something irrationally, even while being entirely aware that it's not technically "good." Like Otter Pops or Roger Moore Bond movies or fried corn dogs. The Electra King is a great example of this. So let's be honest here, right off the bat: The Electra King is basically like driving an enclosed golf cart. But not exactly. See, this plastic, lightning-powered box was intended to be, and sold as a commuter's city car. Curt, the nice gentleman who owns this one, has used it for that very purpose for years, ferrying himself from his Silver Lake home to his job at NBC. Luckily, his commute cut through LA's Griffith Park, so the little King's ~20-30 mph top speed was never a big issue, and the commute fit well within the car's current 20 or so mile range. Recharging was simple as well— an regular extension cord flopped out a window and about 4-6 hours does the trick to top off the six 6-volt marine batteries located under the seat. The Electra King was out of service recently, due to a bad motor speed controller. But the car was eventually fixed by— get this— the woman who played Beverly Crusher on Star Trek: The Next Generation. She wanted to drive the car on stage for a play about Jon Benet Ramsey. Okay, she probably paid an actual electric car specialist to fix it, I assume. Though who knows, the woman was a freaking space doctor. I'm going to give the Electra King high marks here because even if, on paper, this thing is technically pretty crude looking, I have yet to meet anyone who sees it who doesn't smile, just a little. If you're the sort of person who doesn't smile when you see the Electra King hum by, you're probably also the sort of person who, when handed a toy phone by a toddler, says "Uh, this isn't a real phone, ok? YOU LOOK LIKE AN IDIOT." In short, you're dead inside. It also looks remarkably like Mr.Incredible's car in The Incredibles. It's tallish and stumpy, square-cornered, with a hint at a vaguely Corvair-inspired character line and lip around the front. The two-tone color scheme (blue and white) serves the car quite well here, and helps distract from details like the clearly trailer-surplus lighting equipment, and the bumpers that look a bit like the guard rails from industrial kitchen equipment. Even with all the crude edges and perpetually wonky 3-wheel stance, I love the way the Electra King looks. As Curt says, "Everyone sees it and smiles and waves. Imagine if every one of your work days started and ended with your own personal parade." What other car can you say that about? Two of those three points are coming from simple charm, and the last point I'm giving because this is the only car I've ever driven where the transmission gear selector is a simple, old-school toggle switch. The interior's pretty basic. There's a bench seat, nicely upholstered in a matching blue-and-white color scheme, and a wide, flat blue dash with controls that look like they were sourced from someone's grandfather's HAM radio repair toolbox. There's no speedometer (because unless you drive exclusively in funeral processions, you're not speeding, ever), a great old voltmeter, and a battery tester. There's also a big cooking-timer-like knob to remind you when to quit charging, and switches for ignition, lights, wiper, etc. Oh, and Curt installed a modern radio, which is like mounting an iPad on a plow. It's pretty cramped with two people in there, but legroom and headroom isn't as bad as you'd think. There's some under-dash storage as well, above the nose wheel, which is useful. The rear trunk is surprisingly large, and you could actually store a reasonable sized bag in there. Just avoid the little motor controller in the corner, which looks sort of like equipment you might use to reanimate a cadaver. The electric motor makes about one entire horse of power, so my expectations were pretty low. Luckily, electric motors are instant-torque types of motors, so that coupled with minmal weight means from zero to, oh, five feet the King can keep up with just about anything. That first second off the line feels great, but then reality sets in, hard and fast. Which makes you go soft and slow. Acceleration from 5mph to 20 is gradual, if consistent, and acceleration from 25 and up is impressively non-existent. Except maybe if you were to start off from the peak of a huge hill, in which case it would be pants-soakingly terrifying. You'd think at speeds achievable by a bicycle it wouldn't be possible to be terrified. You'd be wrong. The Electra King's brakes are the barest idea of a brake. They're active on the rear wheels only, though even using the word "active" in reference to them is wildly generous. They get a point because I did, eventually, stop, though it's possible the Earth just rotated the opposite way I was heading just enough to give the illusion of stopping. These cable-operated "brakes" even scare the iron-balled owner a bit, and he's considering an upgrade. Luckily for him, absolutely anything he'll do— say, shove some semi-masticated caramels on the brake shoes— will be an upgrade. This gets a three because I wasn't actually being dragged behind the car, and it's pretty fun just being inside the thing, moving. Aside from that, the ride is remarkably like what it must feel like to be towed in a porta-potty at 20 mph. The fiberglass doors and roof seem to be performing an elaborate square dance, one where the rules are no actual edges of door and body can remain in contact for more than a few seconds. 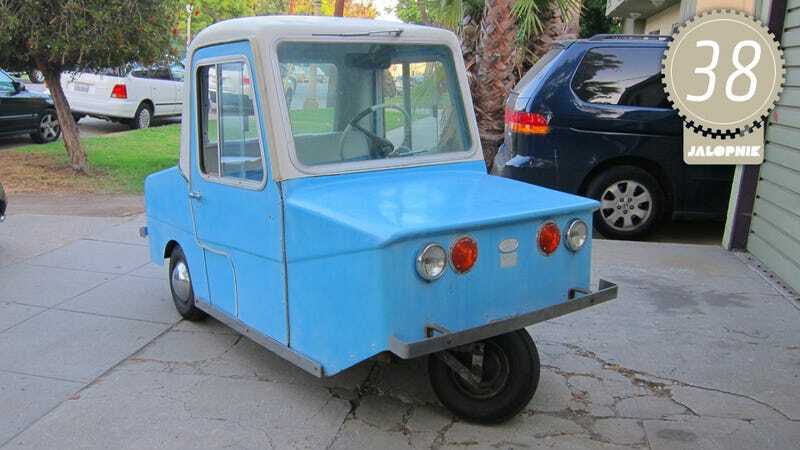 Being a three-wheeler, there's an impressive amount of body roll and lean, and the tiny wheels and wheelbase means any road lumpier than an ice rink causes bounces and squeaky motions not unlike those animals mounted on big springs they have in playgrounds. It's abysmal and a lot of fun. On the track, I was impressed with how you could overste— just kidding. "Handling" is a bit of a generous term here as well. It went where it was pointed, and the three wheel design gave it a very impressive turning radius. But even if you could get this going fast enough for handling to be an issue ('Busa engine?) you likely wouldn't really want to. Think Reliant Robin, but worse. Conversely, the weight distribution is nearly ideal, with the heavy batteries positioned almost exactly in the middle of the car. So, maybe with an extra wheel up front for stability, this could be amazing. Hm. There is no gearbox. And, it doesn't need one. Shifts, being non-existant, are as smooth as non-existant baby unicorn bottoms. So, it's not a problem at all, and therefore gets a score right in the middle. Plus, you can reverse as fast as you can go forward! I think it may handle better that way. Even for a classic, the usability of this car is pretty limited and specific. In decent fettle, it could be a great little neighborhood car, making running errands and visiting local pals a more novel experience. It could even be a commuter car, if you happen to be in that sweet overlap of the Venn diagram of Close By Work and Slow Is Okay, like Curt is. But beyond that? Not so much. You'd only take this on the highway in the bed of a pickup truck, and even crosstown slogs in a city like LA would prove too much of a chore. On the plus side, though, the Electra King has one area of operation almost no other classic (or modern car) can touch: the vast world of indoors. Think of it as a different kind of off-roading. Keeping the car running and in good repair isn't as bad as you'd think. Body and trim parts are rare as Phillips head screws at an Ikea, but the core mechanicals are all pretty common electrical parts that you could find equivalents or upgrades of on Amazon. About the only thing the Electra King does have in spades is charm. It's a cute, plucky sort of underdog charm, but it's sure as hell there. Everyone— and I mean everyone— who sees this thing smiles. Most at least consider the possibility of giving it a hug. Seeing it trundling down the road is like watching some live-action mechanical LOLCats equivalent. It's just absurd and fun. In general, I don't think the classic car community knows exactly what to do with the Electra King, and similar tiny, electric cars of its ilk. There's certainly a collector's market for microcars, and the King shouldn't be all that different. Prices for another tiny monarch, the King Midget, can range from $2000-$7000 or so. King Midgets are a bit more powerful and useful, but not by that much. I see no reason why a well-restored Electra King shouldn't go for around that same price. There's not a huge community, but perhaps that will change as more modern, mainstream electric cars populate our roads. Regardless, there's not many of these things left around, so if you see one, I'd say grab it.